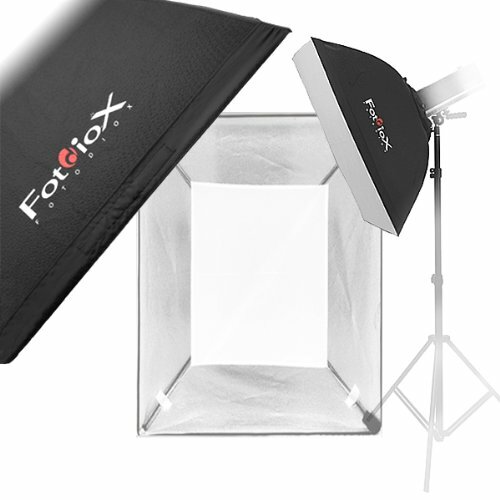 The Fotodiox Pro Softbox is a sturdy and economical version of the standard softbox designs available today and is perfect for studio and multi-day shooting. It is made with Fotodiox's high quality reflective and diffusive materials. The dome of the softbox is made of durable pro-grade omni-bounce silver reflective fabric with black backing. The softbox also features a white diffusive baffle inside the dome to provide softer lighting as needed. An outer, white diffusive cover closes the front of the softbox and is attached by velcro making varied lighting options quick and easy. The dedicated speedring is specifically designed for your strobe light to fit standard softboxes, both rectangular and strip boxes.